Full size blueprints and complete assembly instructions for our 34-String Regency Harp. Detailed prints show you how to build every part needed to build this harp. Once you have cut out all the parts, use the assembly instructions to put all the pieces together. 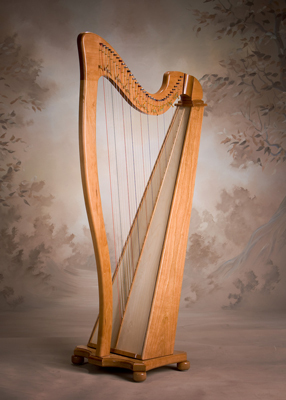 Attached is a photo of the Regency Harps I recently completed. Built of cherry wood with 1/8"; Baltic birch from your stock, and sharping levers on all b, c, e, and f's. A nice and complete set of plans you sell.